Microwave frozen spinach as directed on box, 3 to 4 minutes to thaw. Squeeze dry with paper towels. In medium bowl, mix spinach, ground chicken, garlic and 1 teaspoon salt. Shape into 8 (6x1-inch) logs. Heat 12-inch skillet over medium-low heat. Cook logs 5 minutes; turn. Cover and reduce heat to low; cook 10 minutes. Uncover; cook 5 minutes longer or until thermometer inserted in center of logs reads 165°F and meat is browned. Meanwhile, spray 11-inch griddle or 12-inch skillet with cooking spray; heat over medium-low heat until hot. Separate dough into 8 biscuits. Place 2 biscuits on waxed paper; flatten slightly. Cover with waxed paper; roll each biscuit into 8x4 1/2-inch oval. Place on griddle. Cook 2 to 4 minutes per side or until golden brown and no longer doughy. Repeat with remaining biscuits. Cover with foil and keep warm. Place chicken log in center of each biscuit flatbread. Top with onion slices, tomato slices and sauce. Fold flatbread around filling. Tzatziki is a yogurt sauce mixed with cucumbers. 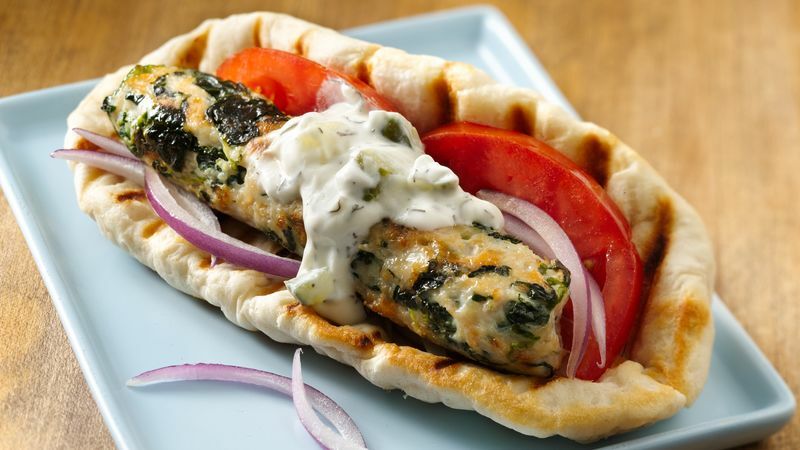 If you can’t find tzatziki look for Greek yogurt veggie dip containing cucumber, dill and feta at your grocery store. Moisten hands with water to easily shape chicken mixture into logs.